I know. This is a Wednesday, but when I started writing about Inside Out last Friday, I realized this movie was a post I needed to write about, not for writing practice, but to explore why it impacted me so profoundly. When I taught American Literature, I told my students that we study history to know the facts of a time period, and we study literature to know how people felt about those facts. That’s one of the reasons I love this movie. Inside Out goes beyond entertainment; it is film as literature. It’s a film that illustrates how we feel about the increase in childhood depression and parental over-involvement, and how we feel about creativity and imagination being replaced with rigid curriculum. On the surface, Inside Out is a brilliant illustration of the way our emotions work to protect and guide us on our journey. The story revolves around Riley, a young girl, and the emotions that work the control panel in her head. The first emotion we encounter is Joy with Riley’s first coo, which is immediately followed by Sadness with Riley’s first newborn cry. Next, we meet Fear; he keeps Riley safe. Disgust keeps Riley from being “poisoned, physically and socially.” Anger “cares very deeply about things being fair.” The personification of emotions lends itself to comedic situations. The deeper level, however, illuminates two very real problems in our society today: depression and helicopter parenting. Right from the beginning of the movie, we see that the battle between Joy and Sadness will determine what kind of life Riley has. What we discover by the end is that the key to a healthy, well-balanced life is to accept the importance of all emotions in our lives, and that Joy and Sadness complement each other, rather than cancel each other out. The other commentary is on helicopter parenting: Joy, as wonderful as she is, starts off bragging about Riley’s “mostly happy memories.” She wrongfully takes credit for Riley being happy, which gives her the false notion that she has to control everything in Riley’s life. The movie takes us on Riley’s physical journey as she moves from Minnesota to San Francisco with her parents, as well as Riley’s emotional journey because of that move. With each disappointment Riley faces at her new home, we see that Joy pushes the other emotions out of Riley’s life. At first, it looks like Joy is right–always looking on the bright side of things is the best way to get through these problems. It isn’t until Riley’s dad is angry on the phone and has to leave that we see Joy’s need to control Riley’s mood might become an issue. Riley is fearful and sad, but Joy won’t let Sadness take over. She insists on Riley being happy. When Riley is remembering a funny moment from their travels, Sadness touches a gold memory orb, and it turns blue. Joy can’t turn it back, and she doesn’t understand why. Sadness needs to touch the happy memories, but because of Joy’s pride over her role in Riley’s life, Joy begins to make a series of bad choices that affect all of Riley’s emotions. While talking to Sadness, Joy says, “Well…you know what? You can’t focus on what’s going wrong. There’s always a way to turn things around, to find the fun!” At first, it sounds like solid advice, but this might not be the healthiest way to deal with difficult and painful situations. Avoiding sadness implies that there is something wrong with that emotion. Joy then wants the emotions to make a list of everything Riley should be happy about. At one point, Anger says, “No, Joy. There’s absolutely no reason for Riley to be happy right now. Let us handle this.” If Riley would’ve expressed her anger, fear, disgust, and sadness, she could have gotten the help she needed from her parents. But when Riley pretends that she is okay, it leads to more suppression of emotions. Riley’s mom says something to Riley that seems innocent and appropriate: “Your dad’s under a lot of pressure. But if you and I can keep smiling, it would be a big help.” Asking Riley to be their “happy girl” and to be responsible for her dad’s feelings are requests we should never make of our children. After this interaction, Riley falls asleep and Joy controls Riley’s dreams– Joy doesn’t think the dream is appropriate for Riley. This is such a powerful statement on helicopter parenting. I’ve seen too many parents do this to their children–from sports to careers–parents are choosing what they think is appropriate, regardless of what the child wants, loves, or excels at. Here is what I have learned as a mom, teacher, and child advocate: Parents need to love their child as he or she is, not as the parents want him or her to be. I get it. Parents have dreams as well–dreams about their children living a happy, fulfilling life. Who better to help their child navigate through that life than the parents who know their child’s strengths and weaknesses? However, once they start this process, parents rationalize the control over every decision and direction. But the reality is everyone is on his or her own path–our children included. We really don’t know what another person needs in order to learn and grow. I know that the control comes from a loving place: Parents are trying to spare a child from feelings of heartbreak and disappointment. But when parents jump in and try to manage their child’s path, feelings, or experiences, they rob the child of a lesson he or she needed in order to learn and grow. If parents don’t let a child have the experiences of heartbreak, disappointment, and failure, the child will never develop the ability to figure out how to do it differently next time. A great illustration of this is when Joy plays the accordion loud and fast the day after the first major crisis. Joy says, “I don’t think of it as playing so much as hugging.” Joy is trying to distract Riley and the other emotions from dealing with the real issues. If everyone does what Joy deems as the correct path, everyone will forget how horrible life is in that moment. Throughout, Joy also tries to control Sadness. Joy’s goal is to help Riley have a “good day… good week…good year, which turns into a good life!” But whose definition of “good” is Joy using? She is using her own, and she thinks she knows Riley better than anyone. Instead of being one emotion in Riley’s life, Joy is trying to become the only emotion in Riley’s life. When Riley starts crying on her first day of school, she starts a negative spiral, not because crying/sadness was bad, but because Riley feared the judgment. Then, because Joy couldn’t accept that Riley was sad, Joy tries to control the core memories, which leads to something in Riley breaking. If Joy would have allowed Riley to feel the sadness and fear, it might have led down a healthy path. Instead, Joy’s controlling behavior led to Joy and Sadness being sucked out of the control room. Riley is then left with only Fear, Anger, and Disgust to control her emotions–definitely a recipe for disaster. Riley now has to navigate her life without Joy and Sadness. Disgust helps Riley give an attitude to her parents in the form of sarcasm. Anger leads Riley to tell her parents to “Just shut up!” emotionally pushing them away while simultaneously invoking Dad’s Anger. Dad adds to the problems by not having an honest conversation with Riley. He says, “Things just got out of hand,” and “Where’s my happy girl?” These are distractions and avoidance rather than helpful when Riley can’t communicate her pain. After this interaction is when “Goofball Island” crumbles. Then Anger destroys Friendship Island. Riley’s three remaining emotions fight with each other and can’t access the necessary emotions to open up and release the pain. The beauty of this interaction, as difficult as it may be to watch, is that it shows how Anger, Disgust, and Fear push people away. Sadness, however, draws people in. We just have to be willing and vulnerable enough to let people see our sadness. The crumbling Islands of Personality is an incredible visual for what happens inside of a person experiencing depression. I can only speak from my own experiences with depression, but it does feel like something is breaking inside. It’s hard to access the good memories. Anger and fear control my thoughts and actions, which then pushes away the people who love me the most. If I can’t have a good cry about it and share my pain with someone who lets me feel my pain without judgment or trying to fix me, the depression will last longer. Halfway through the movie, Bing Bong, Riley’s silly, long-forgotten imaginary friend, shows up. He helps and hinders the progress, but in the end, it is this imaginary figure that becomes the catalyst to Riley’s healing. He also adds humorous scenes. I love Imaginationland, where Bing Bong is “practically the mayor,” for all the beauty and creativity Riley, at one time, accessed daily. It is Imaginationland that saves her in the end. 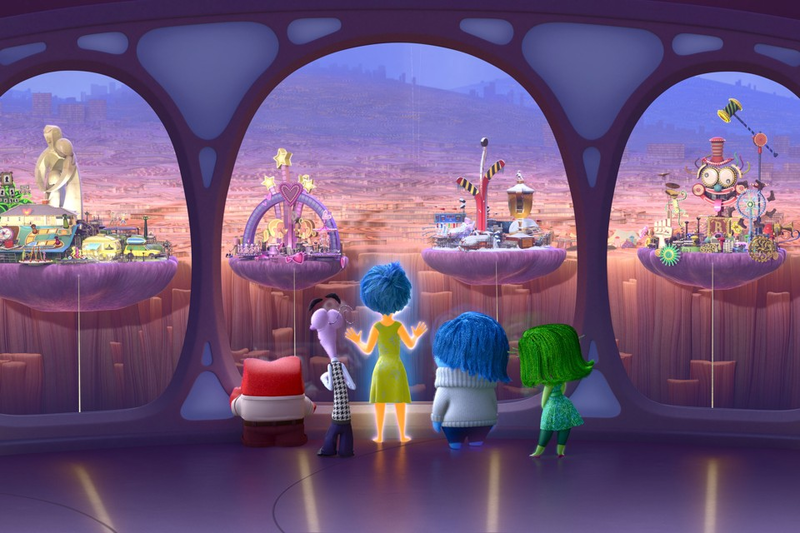 Again, Inside Out subtly points to the importance of creativity and imagination. We should be nurturing that in our children, not taking it out of schools and forcing children to grow up too quickly. Back in the control room, Anger, Fear, and Disgust try to help Riley with her hockey tryouts, but, seriously, how can anything go well when Anger, Fear, and Disgust have the reigns? As Riley is struggling even to skate well, Disgust says a funny but poignant line: “It’s like we don’t learn anything.” Learning cannot take place if the main operating strategies of a child are embroiled in anger, fear, and disgust. This interaction results in Hockey Island crumbling. As Riley’s Islands of Personality crumble, her dream worlds in Imaginationland are also being crushed. It is here that we see what Riley’s dad should have done when Riley was angry earlier. Bing Bong is upset that his rocket was tossed into the dump. Joy tries to make silly faces, just like Dad tried to do with Riley, but that’s not the appropriate response to anger, fear, or pain. What is the right response? Giving the person permission to be sad, sitting next to the person and listening, holding his or her hand, and understanding the pain. Sadness sits next to Bing Bong and says: “I’m sorry they took your rocket. They took something that you loved. It’s gone forever (Joy hates this and thinks Sadness is making the situation worse). . . . I bet you and Riley had great adventures. . . . Yeah. It’s sad.” Bing Bong puts his head on Sadness’ shoulder and cries. Sadness puts an arm around Bing Bong until he’s done crying. After Bing Bong feels heard, understood, and has cried, he can move forward. Even though Joy has seen how Sadness helps in many situations, she pushes Sadness away when they try to get back to Riley through the memory recall tube. This interaction delays their return to the control room. As Family Island falls apart, it cracks the recall tube and sends Joy and Bing Bong to the abyss of lost memories. This leads to the most important, poignant, and heartbreaking scene in the movie. Joy tries to get out of the abyss, but it’s useless. Bing Bong states: “Don’t you get it, Joy? We’re stuck down here. We’re forgotten.” Joy falls to her knees when she sees the blue core memory of Riley crying in class. As Joy watches other sweet memories fade into ash, she cries, “I just wanted Riley to be happy. And now…” Joy finally cries a long, painful cry–Joy finally feels sadness. She wipes a tear away from a gold memory, which rewinds the memory orb to show that the joy Riley felt with her teammates actually started with sadness. It was Sadness that brought Joy–that brought her parents to her side, that brought her teammates to encourage Riley. Joy finally understands the necessity of Sadness. She also understands that Riley’s path is not Joy’s to control. With renewed determination, she has a plan to get back to Riley: Bing Bong’s Rocket. Bing Bong helps Joy get out of the abyss, but he sacrifices himself out of love for Riley. Another beautiful illustration of love. Back in the control room, Anger, Fear, and Disgust have realized their mistake and try to change Riley’s plan, but it’s too late. The console has turned almost black, and Fear states: “Guys. We can’t make Riley feel anything.” My heart aches here, not just for Riley, but for every student I have worked with who had that empty stare. For those beautiful lives that had stopped feeling well before they got to me. I was able to help some, but too many of them were too far into their depression to hear my pleas, to see me sitting next to them offering my shoulder. Through a series of incredible steps and feats, Joy and Sadness get to the control room, but it’s Sadness that has the power to remove the Idea Bulb and change Riley’s path. Sadness touches all the core memories, turning them blue so that Riley can finally speak her pain to her parents. It’s important to note that Riley’s parents speak their own sadness–they are honest with Riley; they don’t try to cover it up or sugar coat it. It is at this point that the three of them are in an embrace, crying and comforting each other so that Riley can finally smile again. Sadness brought Joy. The rest of the movie is filled with much needed comic relief moments. We laugh through our own tears and, hopefully, accept the necessity of sadness in our lives. This entry was posted in Advice For Parents, Favorite Movies, Friday Writing Challenge, Letters to My Students, Pauline's Soap Box and tagged Children, Family, Friday Writing Challenge, Inside Out, Literature, Love, Mother, Obstacles, Parents, Students, Teachers, Teaching. Bookmark the permalink.